Winder City Hall is located at 25 East Midland Avenue, Winder, GA 30680; phone: 770-867-3106. 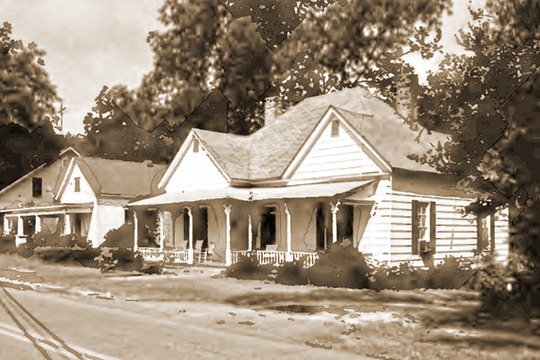 Photo: Homes on Woodlawn Avenue, North Broad Street Residential Historic District, Winder, GA. The Historic District was listed on the National Register of Historic Places in 1984. James R. Lockhart, photographer, 1983, for North Broad Street Residential Historic District, nomination document, #84000888, National Park Service, National Register of Historic Places, Washington, D.C., accessed March, 2016. Winder is the seat of Barrow County, created in 1914 from parts of Walton, Jackson and Gwinnett counties. A portion of the town was formerly within each of these counties. A story is told of an altercation between two men in which, within three minutes, one was shot in Jackson, staggered wounded into Walton, and fell dead in Gwinnett. The town developed around a tavern advertised by an enormous liquor jug. Thus the town was known as Jug Tavern until 1893 when it was incorporated under its present name. It is said that the tavern furnished board and lodging for the night and all the liquor a guest could drink for only 10 cents. A skirmish occurred here in August of 1864, between Confederate cavalry and the 14th Illinois cavalry. Because the six textile plants of the city at one time manufactured overalls almost exclusively, Winder is sometimes called the Overall Center. For the past few years, however, the mills have manufactured men's suits, underwear, riding breeches and blanket-lined leather jackets. Winder also has a lively trade in farm products, principally cotton, with corn ranking second.